A series of dialogues, aimed at considering archaeology as an original perspective from which we can look at the social, economic and cultural complexities of our society, concludes next week. The third and final talk will be on 30 October and looks at Medieval Sicily as a cultural cross-road in the Mediterranean: archaeology brings special insight into a period in which the island was a crucible for the encounter with its Muslim neighbours in north Africa. This encounter and relationship with Islam at the heart of the Mediterranean provides a unique opportunity to examine the role of archaeology in helping to define the heritage of Europe that is inclusive of its rich, sometimes overlooked, history. 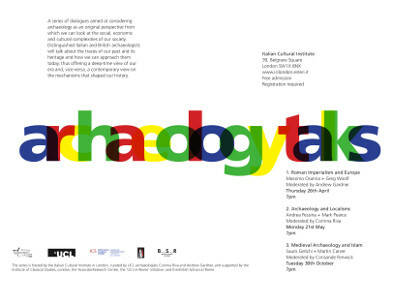 Chaired by Corisande Fenwick, the dialogue will be with Sauro Gelichi, Professor of Medieval Archaeology at the University of Venice Ca' Foscari, and Martin Carver, Emeritus Professor of Archaeology at the University of York.